The WitchDoctor and the Windmill is a story that Linda Syddick Napaltjarri loves to paint. It documents the first contact some of her family group had with European settlement, when, in 1945, they walked out of their Pintupi homelands near Lake MacKay in the Gibson Desert, Western Australia, heading east for Haasts Bluff Mission. Linda was eight years old at the time and the 350 kilometres they travelled was largely over rugged sandhill terrain. As they were walking along, on of their group, the Nangkari, a highly respected medicine man and healer, and his two wives, had lagged behind a little as they approached Mt Liebig. The Nangkari, an elderly man by then, lay down and had a sleep, not seeing the windmill before he closed his eyes. His wives, however, saw it whirring around, and not knowing what it was, took off into the bush screaming. Upon waking, the Nangkari, who had had no experience of white people, also saw the windmill with its vanes flailing in the wind and making a mighty roaring noise. He took it to be the evil spirit, Mamu. To protect his people, he started throwing spears at it, but they just bounced back. He then used his magic powers and produced stones from his body to throw at it, but they, too, failed to stop it. Finally, noticing that the Nangkari and his wives weren’t among the group, Linda’s step-father, Shorty Langkata Tjungurrayi, the owner of many Dreaming stories and also a magic man, walked back to find the missing trio. Shorty already had experience of white settlement and knew that windmills were machines that drew water up from the ground. He managed to convince the Nangkari that it wasn’t the Devil Devil but that it was a device that provided good water. The Nangkari, eventually pacified, drank some of the water, and satisfied that it was good, was happy, and the family group travelled on. 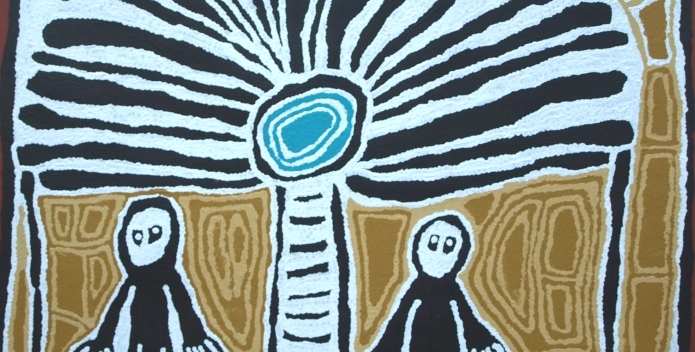 Linda Syddick Napaltjarri has painted all the elements of this story in different canvases, showing the whirring blades of the windmill, the Old Nangkari man and her father Shorty Langkata, the spears and other items that they carried with them in from the desert. Nearby the family group is camped, shown using traditional symbols. All around the central motifs are the Sandhills of the desert, showing where the group of people have travelled from.